An adventure-seeking young man named Adol Christin has just arrived at the town of Minea, which is situated in the land of Esteria. Upon his arrival, he is greeted by a fortune-teller named Sara. She tells him of a vision she had about a fiery-headed swordsman who would determine the fate of Esteria. 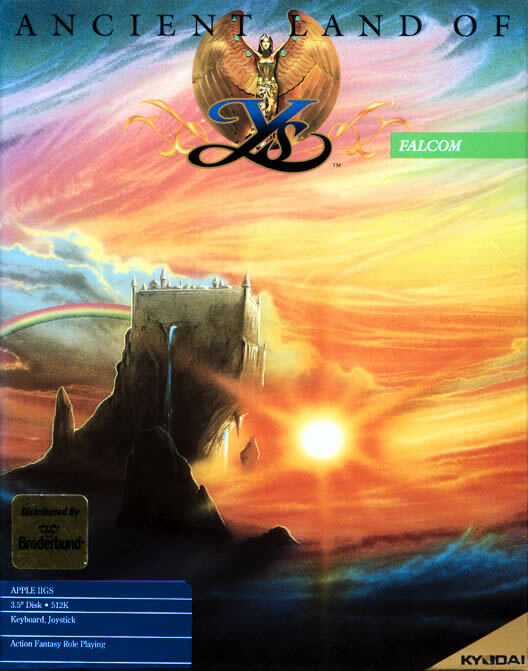 There are six Books of Ys, which come from and are named after a kingdom that once existed in Esteria. They were written by the six priests of Ys before the kingdom vanished seven-hundred years ago. They tell the complete start of the rise and fall of Ys, and they must be found in order to save Esteria. One such book exists in a shrine on top of a nearby mountain. Giving him a crystal, she instructs him to seek out the shrine. Though he isn’t yet aware of where his journey will take him, Adol eagerly accepts the quest. 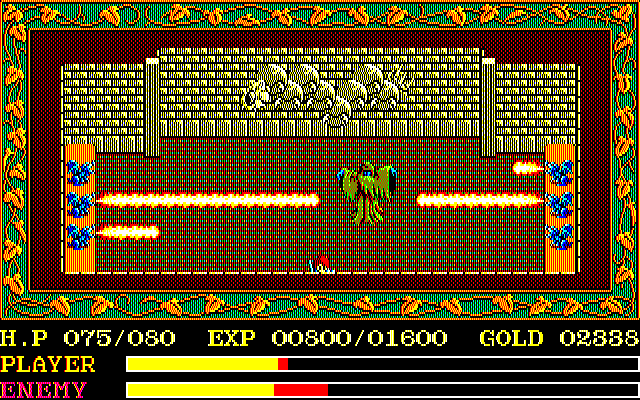 Dragon Slayer was a mold-breaking experience in how it introduced a real-time element to the familiar dungeon-crawling gameplay of the Richard Gariott’s Ultima series. The result was something that vaguely played like Ultima, yet relied heavily on the reflexes one would develop playing popular arcade games. Ancient Ys Vanished provides a slightly different take on the genre Dragon Slayer helped codify. While you still had to go through the correct motions in order to attack in Dragon Slayer owing to the fact that your character only ever faced one direction, Ancient Ys Vanished makes combat even simpler. That is to say, there is no attack button; all you must do to engage monsters in combat is to charge headfirst into them. Those familiar with it may be getting flashbacks to the pioneering, but deeply flawed Hydlide from this description. It’s not an unfair comparison because both games expect players to fight monsters without a button capable of executing attacks, which is quite the paradox. However, there is a minute difference that allows Ancient Ys Vanished to have the edge over Hydlide. In Hydlide, players had to hold down a button that switched the protagonist, Jim, from defense to attack mode. From there, it was a matter of running into enemies and hoping that your damage output exceeded theirs. Ancient Ys Vanished, on the other hand, requires a bit more strategy on the player’s part. In order to successfully strike enemies, Adol must charge into them from an angle. Attempting to run into them dead-center will result in Adol himself taking damage. This can be a little tricky because Adol is only capable of moving in the four cardinal directions, but it’s easy enough to grasp with enough practice. Though you may have a simple enough time defeating enemies on the field, you’ll learn the real dangers in this game are the numerous narrow corridors in dungeons. Most of the time, you can lure enemies outside of them, but if the corridor is too long, you may find your only choice is to brute-force your way through. If he is running low on health, you would do well to retreat from the dungeon. Thankfully, Adol recovers health automatically as long as he is outdoors. If you attempt to leave town and fight as many enemies as you can, you may find such a task borderline insurmountable. Your attacks barely scratch the monsters while they, in turn, can fell Adol in a matter of seconds. This is where the RPG part of the equation comes into play. To make your hero more survivable, you can outfit him with four pieces of equipment: a sword, a shield, an armor set, and a ring. Because there is no attack button, swords only exist to increase Adol’s damage output. A similar principle applies to shields and armor; they merely reduce the damage Adol takes. Rings offer various benefits to Adol. One increases the damage he inflicts while another allows him to regenerate health in dungeons. Finding better weapons isn’t the only way to increase Adol’s combat performance. Ancient Ys Vanished cements itself as a true role-playing game in that Adol gains experience points and gold with every monster he defeats in battle. When he gains enough experience points, he gains a level. Each level increases Adol’s offensive and defensive ratings in addition to giving him more hit points (HP). Though the extra attack and defense power he obtains with each level usually isn’t as significant as the increase in power he obtains from updating equipment, it’s still instrumental to gain as many experience points as possible because the improvements do add up over time. If you find Adol cannot survive against the monsters in an area, it’s either an indication that you attempted to break the game’s intended sequence or you simply haven’t leveled him up enough. Ancient Ys Vanished could also be likened to Nintendo’s contemporary The Legend of Zelda in how the creators took the basic dungeon crawling aspects of various role-playing games and actionized the genre, punctuating the shift by having their work take place from a third-person perspective. However, it could be said that Nihon Falcom went several steps further when it came to actionizing the dungeon crawler. While The Legend of Zelda counterbalanced its action with the occasional puzzle, Ancient Ys Vanished provides a much more straightforward experience. Monsters comprise a vast majority of the obstacles preventing Adol from finding the six Books of Ys. With few puzzles to solve, your only solution is to tough it out and cut down every single one standing in your way. This gives Ancient Ys Vanished a significantly faster pace than The Legend of Zelda or, indeed, most role-playing games. Because it places more of an emphasis on action than The Legend of Zelda, it’s highly fitting that Ancient Ys Vanished is ahead of Nintendo’s effort in one particular field: boss fights. With the exception of the final battle, The Legend of Zelda featured bosses that were only slightly tougher than normal monsters. This isn’t the case with Ancient Ys Vanished; to have any chance of conquering these bosses, you must study their patterns extensively and adopt completely different tactics. This is primarily because bosses aren’t knocked back when Adol collides with them. They still take damage as long as he is moving, but a successful strike won’t interrupt their attack animations. This means many of these encounters are a matter of successfully timing Adol’s movements. The typical strategy is to have him advance after the boss has attacked and pull him back before it can retaliate. Because the concept of boss fights was still relatively new at this point in gaming history, it’s admirable how much thought Nihon Falcom put into creating them. Despite these design choices, there are a few adventure game elements to be found in Ancient Ys Vanished. The game doesn’t feature many puzzles, but you must still scour the dungeons for anything that seems even vaguely helpful. After finding certain items, you can give or show them to NPCs or otherwise use them in a way to help get past an obstacle. Though most items are used automatically, you will occasionally have to select it from inventory screen. Once you have done that, all you need to do is walk into the person or object you wish to use the item on. It’s also important to know that, unlike most of the role-playing games of its day, it’s possible to gain experience points through means other than combat. By entering the Minea’s tavern, you can meet a one-eyed man named Donnis. He worked hard to purchase a sapphire ring for the woman he loved only for him to lose it. As it turns out, the ring is now in the possession of the resident pawn shop owner, Pim. 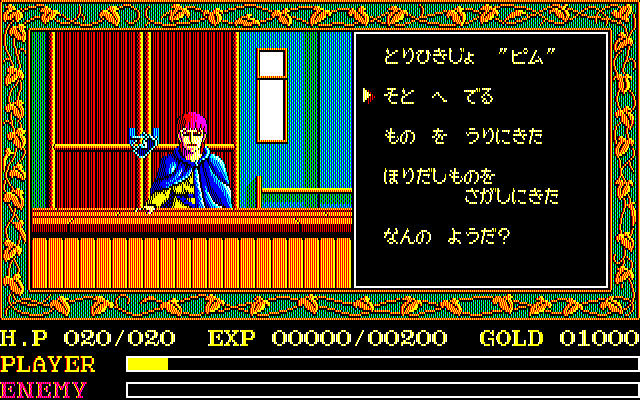 Said proprietor will, in turn, shamelessly sell it to Adol for 1,000 gold pieces. 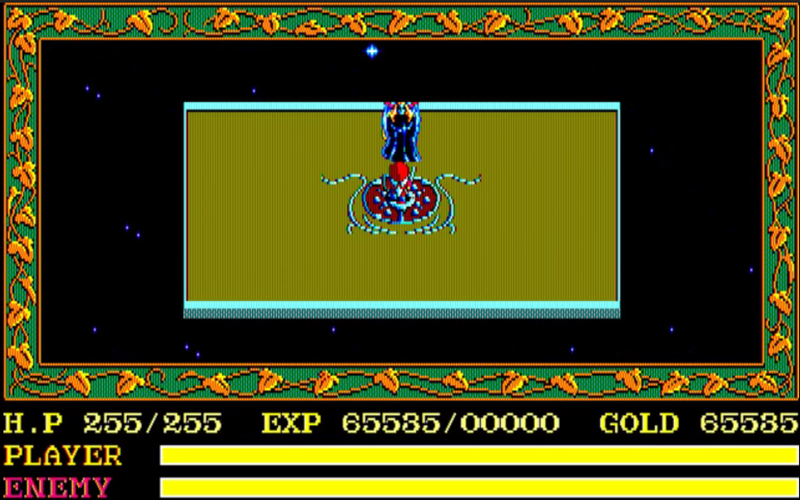 Incidentally, this is the exact amount of gold with which he begins the game. Everything works out in the end because if you give the ring back to Donnis, he will reward you with 1,500 gold pieces. On top of that, you will gain enough experience points to gain a level – all without leaving the town’s gates. While Ancient Ys Vanished was doubtlessly an inventive game for its time, it does have more than a few execution issues. While exploring the second dungeon, a mining system of a ruined village, your visibility is drastically limited, only encompassing a spotlight with a small radius around Adol. Unlike in The Legend of Zelda, there is no item capable of lighting up the area such as a candle or lantern. Although Adol isn’t as hampered as Link by this limitation due to not requiring the player to press a button to launch an attack, it’s still an annoying gimmick because it’s difficult to gauge if you’re attacking off-center when you can’t even see the monster you’re attacking clearly. Because you’re looking for the six Books of Ys, it’s easy to get the impression that there are six dungeons housing a single volume apiece. 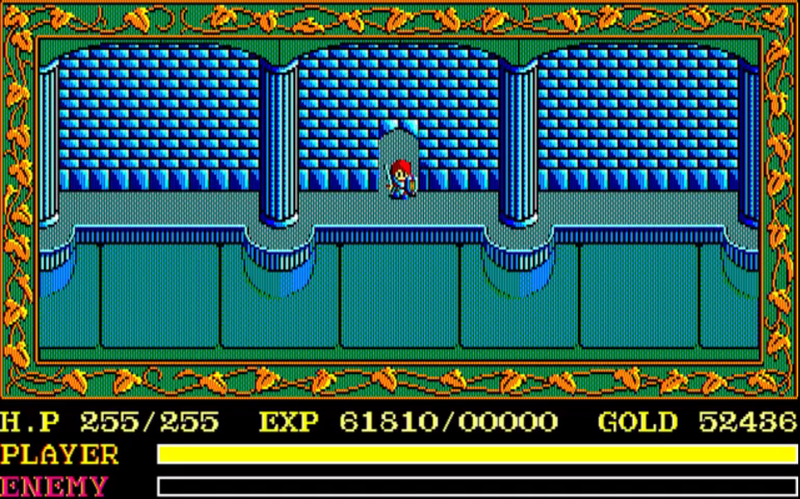 The game appears to follow this pattern at first until a wandering poet named Reah gives Adol the third book as a reward for returning her lost silver harmonica. 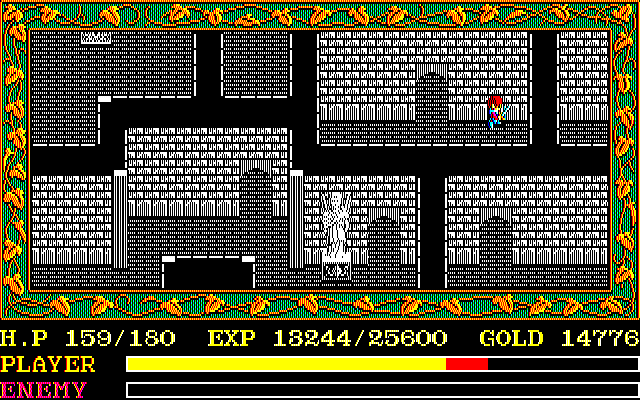 From that point onward, the remaining books are found in the game’s final dungeon: Darm Tower. On the surface, it would appear to be disappointing that half of the books are in the final dungeon, yet it is appropriately long, featuring multiple boss fights and quite a few NPCs to converse with. By the time you reach the top of the tower, you feel the weight of having climbed it, evidenced by the sheer number of levels Adol gains along the way. Having said that, I ultimately have mixed feelings about Darm Tower. Because you’re not allowed to leave upon entering it, you must hope that you have everything you need to succeed. It’s impossible to make the game unwinnable, yet you can accidently render it unnecessarily difficult to complete. Before entering Darm Tower, you will have obtained a set of silver equipment. Because these pieces are significantly better than anything you can buy in Minea, you will likely forgo the best items available in the weapon and armor shops. This would be a grievous error in judgement because you lose the silver equipment shortly after arriving in Darm Tower. In other words, you’re led to believe you can save your money by using the superior free equipment before learning you have just put yourself at a severe disadvantage by doing so when you have to make do with the low-quality pieces you likely purchased at the start of the game. To add insult to injury, gold is completely worthless upon entering Darm Tower, making the effort to conserve it pointless. You can easily purchase every single weapon, shield, and armor set in the game and you will still be guaranteed to amass the maximum amount of gold by the time you reach the final boss. Darm Tower also requires a fair bit of backtracking. 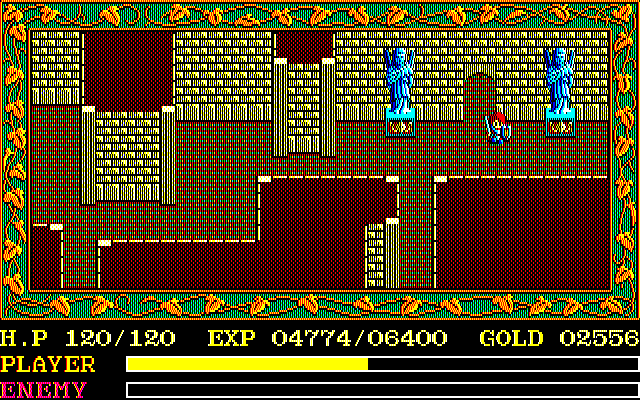 Though the game required players to backtrack before entering Darm Tower, one key factor helped mitigate the task’s inherent tediousness. Specifically, you could purchase a charm called a Wing to immediately evacuate from a dungeon as soon as you found everything you needed. Being a point of no return, that option isn’t available in Darm Tower. If you try to enter with a Wing in tow, it will be confiscated before you get to the door. The amount of backtracking you must do depends on whether or not you’re taking the optimal route. Finding certain items in Darm Tower activates event flags and this isn’t always clear. If you don’t catch on to these subtle cues, you may find yourself having to walk away from the door blocking access to the final boss and descend multiple floors in order to speak with the one person who has the item you need to proceed. You then get to walk all the way back to said door, fighting monsters that stopped being a threat all the while. Fortunately, even if there were several bumps along the way, the final encounter with the primary antagonist is well executed. To begin with, the music when you reach the top of the tower successfully evokes a sense of dread one wouldn’t normally get from a game in this era. When Adol comes face-to-face with him, he reveals his name to be Dark Fact – a descendant of Priest Fact from Ancient Ys. He expresses admiration over Adol’s efforts to collect the books only to reveal that the swordsman has only helped his plan. Dark Fact bears the sixth book, and now that they’re gathered at the top of Darm Tower, the power dwelling within them will be revealed. He then challenges Adol to a duel to the death. The winner will have the great power bestowed upon him. Though he gives what would be considered a standard villain speech by today’s standards, it does paint Dark Fact as a more calculating antagonist than what people were used to seeing at that point in history. In most RPGs from the eighties, the antagonist waited in their lair until a hero came barging in the front door to kill them. Here, Dark Fact took notice of Adol’s journey and, rather than directly stop him, had the intrepid adventurer gather all of the books so he could take them all in one fell swoop. Though Adol only meets him at the end of the game, NPC dialogue reveals Dark Fact to be a proactive villain, being responsible for a rash of silver thefts. You still encounter him at the end of the final dungeon, but he has as much of a reason to be there as Adol. As Adol ascends Darm Tower, he will likely happen upon the Flame Sword, the Battle Armor, and the Battle Shield. These three pieces of equipment are the strongest in the game, providing bonuses to Adol’s stats that put even the silver counterparts to shame. If you use them against Dark Fact, you get to watch him make mincemeat out of Adol. The reason he has been orchestrating the silver thefts is because the material happens to be his primary weakness. One character even outright states before this encounter that you need the silver equipment to have any chance against Dark Fact. If you ignore this advice, you’ll discover that you can’t even damage him and his projectiles will be nearly impossible to dodge. Therefore, in what appears to be a violation of common sense, you must downgrade your equipment to the second-strongest sets. What I admire about this development is that it seems to play around with typical RPG conventions before they had chance to cement. In order to complete the game, you must look beyond what the numbers say and truly immerse yourself in the role you’ve been given. Upon vanquishing Dark Fact, Adol obtains Priest Fact’s volume. He reads that the ancient land of Ys vanished into the sky. Shortly after this revelation, Adol is enveloped in a blinding white light. He has succeeded in his quest, but his true journey is just getting started. With its fast-paced gameplay, surprisingly inventive combat, and creative boss fights, Ancient Ys Vanished is a commendable effort for its time. Most computer RPGs at the time required a degree of expertise most enthusiasts either didn’t have or the time to develop. Ancient Ys Vanished, on the other hand, provided a succinct, straightforward experience that was easy for anyone to pick up and play. This went a long way in introducing the role-playing game to those who were otherwise reluctant to try them out. This isn’t to say Ancient Ys Vanished is the product of Nihon Falcom taking a complicated genre and dumbing it down to reach the lowest common denominator. Despite being firmly on the “action” side of the action RPG equation, it’s not merely an action title with RPG elements. In fact, there is quite a bit of ingenuity to be found in the few moving parts this game has. Even with this in mind, it’s still easy to make the case that Ancient Ys Vanished is an overly simplistic game and it’s an understandable conclusion. With only one goal at a given time, a repetitive combat engine, and little in the way of sidequests, Ancient Ys Vanished is surprisingly low on replay value for a role-playing game. At the very least, your reasons for revisiting it aren’t going to be the same as the ones you would have for a game such as Final Fantasy, Ultima, or even The Legend of Zelda. At the same time, I would say the game’s simplicity ensures that it has not been rendered inaccessible from a modern standpoint despite certainly showing its age. The good news is that this game has been remade innumerable times, so finding a version on your platform of choice isn’t difficult at all. Coupled with its short length, you won’t have invest too much time to see it through to the end. Ancient Ys Vanished may not have received significant international attention, but its impact on the medium is undeniable. Trapping you in the last dungeon after taking away your equipment? Old JRPGs did things that modern ones would never be able to get away with. 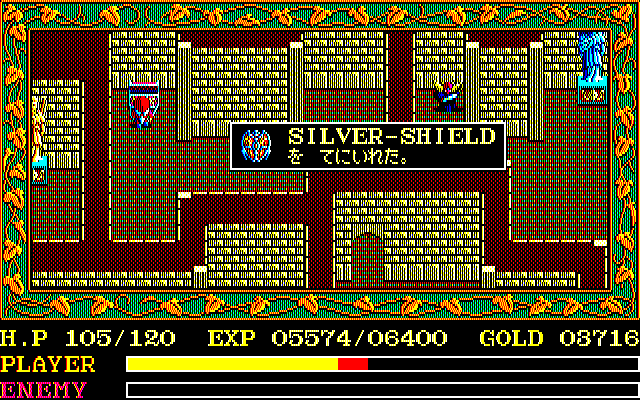 The game doesn’t take the silver equipment away immediately, which is what makes it sinister; if it did, then you could simply reload a save and buy the third-tier equipment. As it stands, it’s easy to save into a tricky position and have no way out. Granted, it’s not possible to make the game unwinnable, there really isn’t anything in the way of sidequests to miss out on, and it’s completely possible to salvage things with inferior equipment, but it’s pretty much guaranteed to trip people up the first time around. Reading over what you wrote here, a lot of the features do definitely sounds like they’re more in place for games built a generation or so after this one. Interestingly advanced for its time. Although, I imagine it’s a little hard to get a good dialogue going about this game, because nobody knows how to pronounce it. How are you supposed to say ‘Ys’ anyway? Yeah, despite its simplistic nature, there are a lot of incredibly forward-looking ideas in this game; it’s amazing the team implemented them back in 1987 in a game that placed a larger emphasis on gameplay over story. Oh, I found out how to pronounce it by watching the introduction to Ys Book I & II; it’s kind of pronounced like “ease” only with a “c” sound instead of an “s” sound.